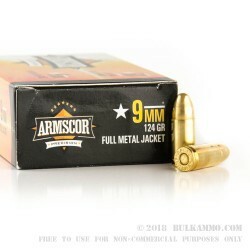 Such a simple and straightforward offering, this is a great price point for commodity 9mm ammunition for normal range and plinking use. The Armscor company is a Philippines based operation that offers now, a production facility in the USA in a couple of different states: Nevada and Montana. The company operates on a lean budget and yet, is clearly growing as they have made some important moves in innovation and marketing, which have allowed them to bring quality ammunition and firearms to the market more readily. 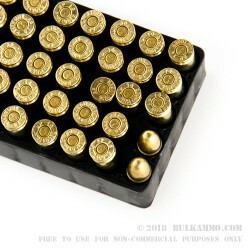 There isn’t much to say about this ammunition that happens to be one of the most popular configurations of ammunition in the world. 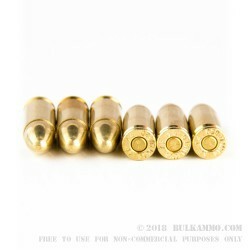 It is a 9mm, 124 grain projectile in a brass plated configuration with a brass case and a Boxer primer. The accuracy is above average and the static ballistics are very middle of the road. 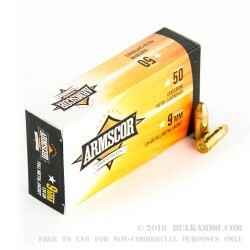 The best story to tell about this Armscor ammunition is that it is reliable and cheap, the price point is low for the relatively accurate, very reliable production quality. Recoil is lower than larger grain weights and functionality is high for the mainstream firearms on the market.